Ford Motor Co. and Walmart are teaming up to explore how autonomous vehicles could be used for grocery delivery. 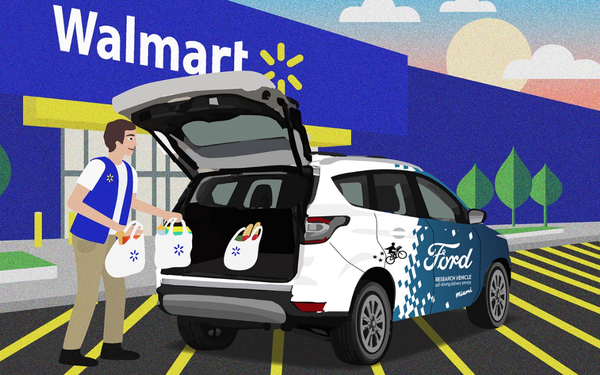 Enabled by Postmates delivery as a service, the companies set up a pilot program in Miami-Dade County to test how self-driving vehicles can complement Walmart’s existing delivery offerings, Brian Wolf, director, business development, Ford Autonomous Vehicles, wrote in a blog post. “We’re still learning -- it’s a pilot -- but, we want to make sure we stay on the cutting edge of grocery delivery by exploring what’s new and next,” says Tom Ward, senior vice president, digital operations, Walmart U.S.
Walmart also recently developed a small pilot project with self-driving technology development company to start exploring how customers will want to use self-driving cars for grocery shopping. Doubling down on the commercial side of self-driving technology is a safer bet for Ford, and could pay off well in the end, says Jeremy Acevedo, Edmunds' manager of industry analysis. “Solving commercial challenges is far easier than solving commuter ones, and is most likely the area where self-driving technology will take off first,” Acevedo says. “This partnership almost serves as a rolling demonstration for Ford to prove the value of self-driving technology to consumers in a very practical way. People may not be willing to trust a self-driving car to take them somewhere, but if the car is going to bring things to them and make their lives a little easier, suddenly the technology is a lot less scary." 1 comment about "Ford Partners With Walmart For Autonomous Delivery Trial". R MARK REASBECK from www.USAonly.US , November 15, 2018 at 7:42 p.m.
does it really make a difference if the groceries are delivered to their house with or without a driver? I would think, following the lazy-*ss scenerio, that the driver would bring them up to the door , versus you having to go out of your house and walk to a self driving car, open the door and strain all the way back carrying those heavy kale bags, to the house. So what happens when you have some "grocery getters" who stalk one of these driverless cars, and follow it to it's destination. How does the car know that the people opening the car doors are legit, or just swiping the grub???? Tech people NEVER think out the "What Ifs" !!! !